About meI have always been interested in books, but more as a collector than as a reader. In fact I use my library as one giant encyclopaedia and nobody is reading an encyclopaedia from the first to the past page! I'm a freemason and therefor "the core business" of my library is about freemasonry. But by studying freemasonry and it's history the fields of interest increases and lead inevitably to all kinds of other subjects, like the ones mentioned in the next section of this profile. Besides my own library I'm also librarian of the combined library of the seven masonic lodges from Rotterdam (MBRLibrary). You can visit that library at http://www.librarything.nl/profile/MBRLibrary. About my libraryMy library consists of over 3800 books in all kind of categories such as (besides the more common categories): freemasonry, rosicrucianism, theology, physico-theology (e.g. John Ray, William Derham, Bernard Nieuwentyt, Samual Clarke), mythology, mystics, magic, judaism, philosophy (as Bayle, Spinoza and other representatives of the Radical Enlightenment), alchemy, hermetism, kabbalah (e.g. Scholem, Idel, Dan), history of science (e.g. Isaac Newton, the brothers Keill, J.Th. Desaguliers, William Whiston, Petrus van Musschenbroek, Willem Jacob 's-Gravesande, Herman Boerhaave), etc. etc. I'm specially interested in the beginnings of Freemasonry in England as well as the start of modern science and therefor for instance also in the "Royal Society of London for Improving Natural Knowledge" and lots of it's members, of which many were freemasons, like Isaac Newton's assistant and experimentor J.Th Desaguliers! In the Royal Society it was, like in masonic lodges, not allowed to discuss politics and religion! In general I'm interested in books about, or better still: written by people who dared searching for truth themselves instead of blind accepting church dogma's (sapere aude -dare to know!). A lot of "natural philosophers" of those days (like Newton) were theologians as well. This combination often led to what is called "physico-theology", where people tried to prove the existense of God out of His Works (masons: in my opinion this -related to Geometry- is the most important meaning of the F.C.!). And remind you, that proving God's existance was Newton's main reason of exploring the laws of nature! Apart from the rise of physico-theology I get more and more convinced that (our!) Freemasonry started in the beginning of the 18th century (apart ofcourse as a reaction to all the previous wars on religion) as a result of the fear of some, that the rapid rise of natural philosophy should become a huge thread to religion and inevitable should lead to atheism and immorality. This also was the main reason for John Robinson (the Scottish "Desaguliers") for writing his "Proofs of a conspiracy..." from 1796. The Irish philosopher George Berkeley in his "The Analyst; or, a Discourse addressed to an Infidel Mathematician (...)", accused mathematicians (he pointed at Edmund Haley) of such infidelity. This must have hurt Newton deeply. Others defended Newton, like the Royal Society secretary and freemason James Jurin in "Geometry no friend to Infidelity: or, a Defence of Sir Isaac Newton and the British Mathematicians (...)" as an answer to Berkeley. I have a lot of books and magazines (e.g. Gentleman's Magazine being the first periodical that used the term magazine"!) from the beginning of the 18th century, dealing with this fear of theologians and some natural philosophers as well. So I get more and more convinced that Desaguliers (Newtons friend and assistant) "(re)started Freemasonry" to honour his employer Newton. I disagree (like John Hamill of the UGLoE) the opinion that the rise of modern freemasonry had to do with the 50 Churches project of Queen Anne! 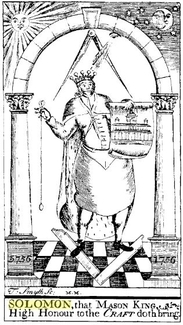 Desaguliers owned the book "Orbis Miraculum" (1649), in which Samuel Lee gave a detailed description of King Solomo's Temple. I know this because this book with his signature was offered at Ebay some years ago. I have a facsimile of the "Orbis Miraculum" in my library. Considering this fear for atheism, Anderson's first charge becomes very understandable: "A mason is obliged to obey the Moral Law (see also next paragraph!-JT-) and if he rightly understands the Art HE WILL NEVER BE A STUPID ATHEIST NOR AN IRRELIGIOUS LIBERTINE (...)". Till so far my opinion about the start and purpose of nowadays freemasonry (which started in 1721 and NOT in 1717!). I prefer collecting (and smelling!) the original books from the period of which the masonic seeds are already to be found (I think) in the pioneering works of Sir Francis Bacon. Also interesting are some of the old book-plates. Googling on the former owners names give sometimes surprising results. Absolutely unique in my collection is Plot's "Natural History of Staffordshire" from 1686 in which he gives a long account of the spread of speculative (!) free-masonry in those days (incl. gloves for the ladies...), which free-masonry later was revived by Desaguliers as explained above. Another very special book in my library is James Anderson's "Royal Genealogies", of which I have the first and second printing (resp. 1732 and 1736). in this book I discovered that Anderson himself (!) wrote that the Ark of the Covenant in King Solomons Temple contained the stone tablets "WITH THE MORAL LAW ON THEM", being the same "Moral Law" Anderson writes about in his famous first charge of his Old Charges as incorporated in his masonic "Book of Constitutions" from 1723 and 1738! I have made comments on lots of my oldest sources and cited a lot of very interesting unique masonic information out of them. Especially masons I advise to read the comments in my library, starting with the oldest books! Instead of only the list view, also try the cover-view now and again. I made hundred's of photo's of the covers or title-pages myself, if they were not available on LT.
Q: What is the master word? And that several years before the degree of Master Mason develloped.